For those of you who are interested in seeing the next gourd I carved, here it is. Crochet topped gourd with the end result not really to my liking. As i had this idea in my head and it really didn’t end up as i had imagined. However my mother thought it wonderful . It was a real learning project. Firstly, if you are doing patterns each one should be the same. Uniformity looks so much better. I had to do this pattern free hand to try to emulate a crochet pattern as there was nothing suitable that would conform to the shape of the gourd. Secondly, remember gourds dont conform to the thickness rule. Their shell may vary from one spot to another. Thirdly, unlike wood when you make a mistake in carving, it is so much more difficult to rectify. Good to see that you are enjoying learning new skills. Are you doing the carving while the gourd is still fresh, or do you dry the gourd first? Not quite the same as comparing green wood to seasoned, but I’m curious. Interesting piece, and I’m waiting to see your next one. All the gourds I have are completely dry and have a very hard outer shell that you have to remove before working on. Mainly to make carving easier and that any staining or painting will take evenly. Realy impressive work, you must have been very patience to make this. This is really beautiful work. I see this kind of work and immediately know I don’t have the patients for this type of fine work. If you made a nice little wooden box to display each carved gourd on I would think it would be ok to post them here. Just include the box details in your description. I think it looks great. Do you grow your own gourds too? Very eye catching. I think the non-uniformity looks good; it provides a hand made look versus something from a machine. 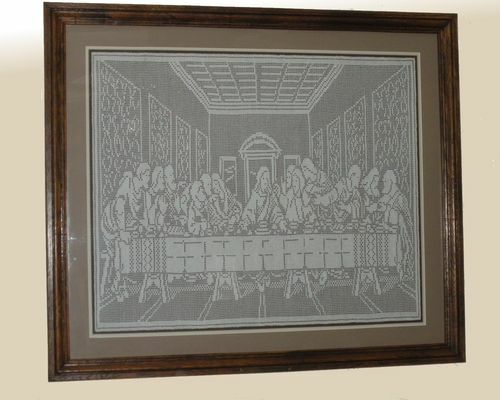 Theresa, this piece is so outstanding and it displays a wealth of wonderful details and fine craftsmanship. Another beautiful one. I looked a you Facebook page, even though I don’t do Facebook. You are a very talented lady, in a sorts of arts. TJ, You are improving by Leaps and Bounds! At first glance, I wondered why you crochet a cover for a Gourd! Then, after more study, you Carved the crochet pattern!! I tried growing them one season but failed due extreme weather. Was considering of trying again this year actually. A great idea about including a box to display the gourd on Tony. It would certainly qualify posting here. As they say practice practice practice and you do slowly improve. Very interesting, Just love seeing things done differently. I was visiting my Dad this week and showed him your gourd. Mom (who just passed away this year at 98 and was still crocheting virtually every day) was a superb crocheter of every kind of item. Dad was blown away by your carving and wished that Mom were here to see it, too. You put a smile on his face. Thanks. Here are a couple of samples of her work. 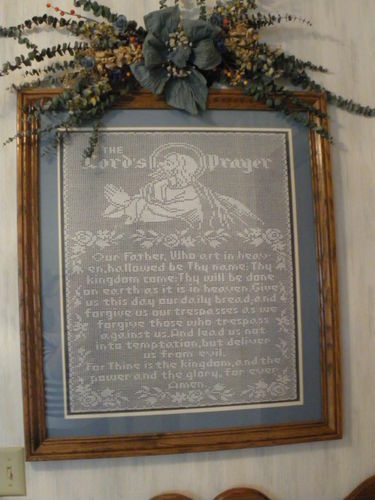 She made seven of the Lord’s Prayer pictures—all in one year. I did all the framing for the pieces. That’s awesome, and it really looks like natural crocheting. Nicely done.